If you’ve ever spent time on Instagram scrolling through photos of the great American Southwest, you’ve undoubtedly come across an image of the Wave. Whether you’re a seasoned hiker or new on the outdoor scene, it’s hard to see a photo of the Wave and not want to hike it. That being said, the Wave is an incredibly popular hiking destination, so land managers have strictly limited access to the lucky few who can secure a permit for a given day. Hiking the Wave, then, takes a significant amount of pre-planning and preparation before you ever set foot on the trail. Navigating the world of land management bureaucracy can be challenging, to say the least, which is why we’ve created the ultimate guide to hiking the Wave in Arizona. Coming up, we’ve got information on what the Wave actually is, hot tips on how to secure a permit or win the walk-in lottery, and all of the other information you’d need to make your trip a success. Here we go! Is hiking the Wave right for you? 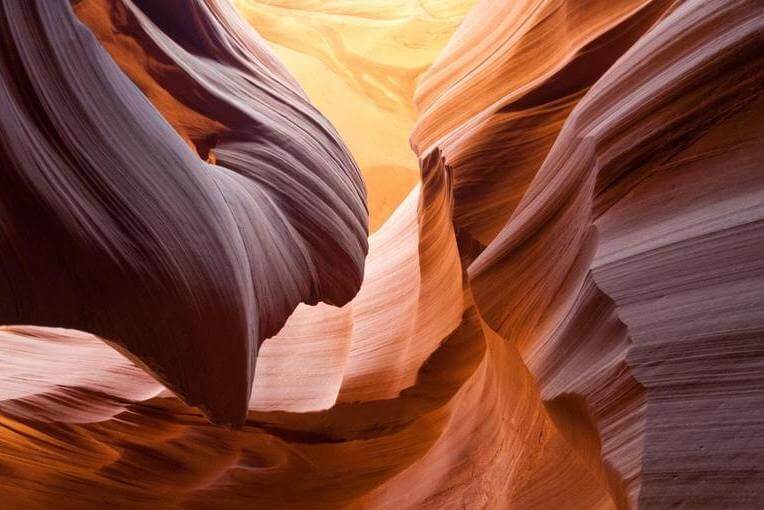 Sculpted by the forces of time from a gorgeous piece of red sandstone, the Wave is a stunning natural landscape on the Arizona/Utah Border. 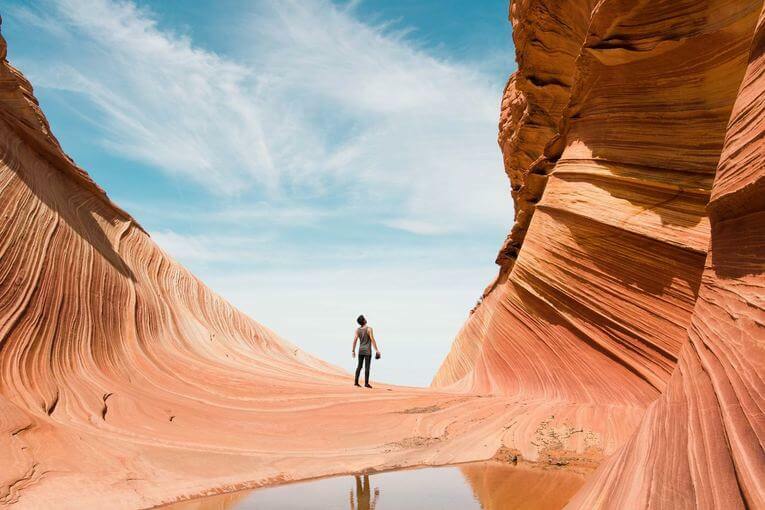 Situated in the middle of the Paria Canyon-Vermilion Cliffs Wilderness of the Colorado Plateau, the Wave is on the slopes of the Coyote Buttes and is managed by the Bureau of Land Management in partnership with the Grand Staircase-Escalante National Monument in Kanab, Utah. The Wave is very well known to hikers for its colorful undulating wave-like patterns, which makes it a fan favorite for professional and amateur photographers, alike. It is located on the ancestral land of the Pueblo and Paiute people, whose mark can be seen in various places on the wave in the form of rock art and drawings. The hike to the Wave is actually quite difficult, but all who make it to the Wave find themselves in awe of this display of beauty in the natural world. Since the Wave is so popular among outdoor enthusiasts, the Bureau of Land Management (BLM) has instituted a strict permit policy to control visitors to the site. Although it may seem unfair that only a handful of people can visit the Wave in a given day, such regulations are necessary to protect such a fragile site. Getting a permit for the Wave can be done in one of two ways: either through advanced online registration or through the in-person lottery. Regardless of how you apply, the BLM allows only twenty hiking permits per day for individuals: ten for the online lottery and ten for the in-person lottery. If you have the chance to plan your trip in advance, the online lottery is the way to go. All applications for the online lottery are through the Coyote Buttes North Lottery page on the BLM website. The permit fee is $7 per person plus an additional $5 application fee, which is non-refundable, even if you are unsuccessful in securing a permit. To apply online, you must head to the BLM website and watch an informational video about the Wave. After doing so, you can submit an application for up to three different hiking dates in a given month. Applications for the online lottery open at 12:00 pm Mountain Time on the first day of the month, four months prior to the month you want to hike in. Thus, if you wanted to hike the Wave in December, you’d submit an online application sometime between August 1st and 31st. You can enter in three different hiking dates into your application to increase your odds of winning the lottery. The lottery for December would take place at 9:00 am Mountain Time on the morning of September 1st, at which time you’ll get an email telling you if you were successful in obtaining a permit. If you’re lucky enough to get a permit, you’ll have 14 days to confirm that you still want the permit and to pay for it online. If you fail to do so by the deadline, you’ll forfeit your permit and it’ll go back into the system for another hiker to win. The more spontaneous among us may find that the online lottery system doesn’t quite work for them. When you can’t even plan what you’re doing tomorrow, it can be difficult to nail down a specific date or two that you’d want to hike the Wave, especially when that date is four months out. Luckily, the BLM keeps half of its Wave permits for a walk-in lottery, so you can still have a chance to ride the Wave, even without applying in advanced. The Wave walk-in lottery only happens at the Grand Staircase-Escalante National Monument Visitor Center in Kanab, Utah. From mid-March to mid-November, the lottery is a 7-day a week event. From mid-November to mid-March, permits are only issued on Monday through Friday, so Saturday, Sunday, and Monday permits are issued on the preceding Friday. For the walk-in lottery, permits are drawn each morning at 9:00 am for the following day’s hike. This means you’ll want to arrive at the visitor’s center at 8:30 am at the absolute latest to ensure you have enough time to submit an application. Success in the walk-in lottery is really the luck of the draw as there’s not really much you can do when you arrive to increase your chances of success. Only 10 permits are issued in the walk-in lottery each day, so you can luck out and compete against only a couple dozen other individuals or find yourself applying last minute with 300 of your new best friends. The odds of getting a permit really depend on how many other people apply for a permit on the same days you want to hike. It’s easy to get an idea of what your odds are for a permit if you apply using the online system. As you enter the dates for your potential Wave hike into the system, scroll down to the bottom of the page to see a table that shows how many applicants have already been submitted for the various days in the month. If you have lots of flexibility in your free time, you can use this chart to your advantage. By applying toward the end of the month, you can get a good idea of what days are the least popular for permit applications and choose those dates for yourself. Doing so will increase your chances of getting a permit, but nothing is guaranteed. If you can’t be that flexible in your travel plans, consider heading to the area during a less popular time. Generally speaking, the spring, summer, and fall months are the most popular months for permit applications. Between April and November, only 4-8% of applicants are successful in snagging a permit. On the other hand, 25% of all applicants for permits between December and March are successful. We’d certainly take 25% odds over 4% odds any day. The walk-in lottery is equally reliant on luck, as it’s hard to predict when people will try to get a walk-in permit. Although this process really comes down to sheer luck, you can increase your chances of winning the walk-in lottery by planning your trip to be a mid-week adventure, in the winter, and not at the same time as any major holiday or school vacation. The Wave is accessible via four different trailheads that lead into Paria Canyon and the Wave area. The shortest and most popular hike is from the Wire Pass Trailhead, so that’s what we’ll focus on here. The Wire Pass Trailhead is a gateway to out-of-this-world scenery and some of the best hiking in the Desert Southwest. It is located in the Paria Canyon-Vermilion Cliffs Wilderness Area and is approximately 8.3 miles south of US 89 along House Rock Valley Road on the Utah side of the Utah-Arizona border. From Kanab, Utah, home of the Grand Staircase-Escalante National Monument Visitor Center where you can apply for the walk-in lottery, the directions are quite simple. Leave Kanab on US 89 southbound, following the road for about 38 miles. Take a right onto House Rock Valley Road and stay on the road until you reach the trailhead about 8.3 miles south of the US 89 intersection. Overall, you can expect the drive from Kanab to take about 1-2 hours. The Wire Pass Trailhead has a pit toilet in the parking lot but has no campsites or water. The closest designated campsite (with pit toilet) is about 2 miles further south on House Rock Valley Road. In the desert southwest, preparation is key. The harsh reality of this stunning landscape is that you’ll find no water, no food, no supplies, and minimal help should you run into trouble. This unforgiving landscape is best explored by the prepared and the experienced and should not be taken lightly. Although you might start your hike in the cool, brisk temperatures of the morning, as soon as the sun rises in the middle of the summer, you’ll quickly be shedding layers and wishing it was about 40 degrees Fahrenheit cooler than it currently is. Dehydration sets in quickly in these conditions if you don’t stay on top of your hydration. If you let yourself get too dehydrated in the heat, it could quickly turn into heat exhaustion or, worse, heat stroke – a life-threatening condition. Other things that might be handy include a sun shirt (to protect your skin from the sun’s harmful rays) and a satellite messaging device, as cell service can be spotty out there. Ultimately, though, the most important piece of gear you bring is your brain and you have to be willing to turn back if things go awry. As we’ve mentioned before, the most popular place to start your Wave hike is at the Wire Pass Trailhead. This trailhead allows for an out-and-back hike to the Wave that’s just 5.2 miles roundtrip. The trail itself is mostly sand and bedrock but is mostly flat with an elevation change of just 400 feet. The real challenge with hiking the Wave (beyond the permitting system, of course) is the desert heat and the dryness of the conditions. Since the trail is so short and is relatively flat, people who do manage to secure permits sometimes misjudge the terrain and find themselves caught out with no food or water during the midday heat. Other times, people start their hike so late in the day that they end up getting benighted without proper overnight supplies. Beyond the difficulty of the actual hike, there are some things you should know about the trail. First things first, the trail isn’t as easy to follow as you might imagine. Since visitors are so minimal to the area, don’t expect great big paved trails with signs every 100 feet like you would in a popular national park. Once you leave the parking lot, you’ll cross the road and enter into a river wash, walking north for about a half a mile until you find a single sign to remind you that you need a permit to be there. After this point, you’re on your own and need to rely on your map, compass, and GPS skills to travel through this sandy desert. As soon as you get yourself on the “trail,” you’ll follow it up and over a ridge, where the landscape will quickly shift from soft sand to hard rock There will be some signs along the way to steer you onto the right path. Eventually, you’ll pass through a couple of small sand dunes and find yourself riding the Wave! Now is your time to enjoy the magic of this place, but don’t forget to leave ample time before sunset for the hike back to the car. Hiking the Wave is no joke and should only be attempted by experienced hikers who are skilled in the art of map and compass navigation. Only hikers who will come prepared for the challenges of the desert southwest should attempt the Wave as this is really not a great place to get lost without food and water. A moderate to high level of fitness is also handy so you’ll be able to explore the area more after checking out the Wave. Oh, and it might go without saying, but don’t try to hike the Wave without a permit – Rangers do patrol the area and won’t shy away from ticketing you if you’re caught out there without the proper documentation. But, if you do manage to secure a permit and are ready and prepared for the hike, you’ll be awed by the absolutely jaw-dropping scenery around you. The Wave is a once-in-a-lifetime hike for most of us and it’s worth all the effort. Happy trails!